Is it worth spending $1.25 on a Twitter application? I couldn’t imagine spending money for a Twitter app, but lately I’ve become so frustrated at Sesmic, Tweetdeck and the Twitter website that I found myself asking my followers for recommendations. The result? I purchased Falcon Pro for Android, which cost me $1.25. 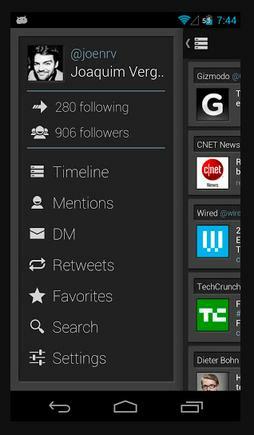 Now, Falcon Pro has one major flaw, for my purposes, which is that it doesn’t handle multiple accounts. In all other respects, however, it’s an excellent app. Unlike many Twitter clients, which cram everything into a single smartphone screen, Falcon Pro uses a simple swipe system to incorporate the most important elements of Twitter. Swipe your finger left to right, and your personal details pop up in view. It lists your current follower numbers, and lets you access direct messages, retweets, mentions, favourites and settings. Swipe right to left, and you’ll see your lists, saved searches and global trends. On the main screen, the display is a subdued grey with white text, making things look professional and uncluttered. You can increase the text size - or decrease it if you’re feeling masochistic. A bar along the top displays the current unseen tweet, mention and DM counts, and also offers quick access to a status update. Double click on the unread tweet number, and it will reset, taking you to the absolute top of your timeline. Images are shown inline (unless you opt not to show them), and if you click on a tweet with a link or image, it opens to a full screen, showing the image or link preview beneath the tweet. It’s a nice touch, although sometimes the text on the accompanying link is far too small to be useful. I found the stuff.co.nz links worked well, opening the mobile version which was readable and clear. Also, this feature can be switched to wi-fi only, saving you data costs, or switched off altogether. It’s very customisable and all the configurable settings are useful. Updating status is straightforward, and the option to choose a gallery image or take a picture directly is nicely delineated. Press and hold any tweet to get the options for reply, retweet, favourite, share, and more. You can also just touch the tweet to see it in fullscreen mode, where all options are visible. To retweet, click on the tweet, click the retweet button and - joy - you get a compose screen with the retweet text, which gracefully allows you to comment, edit and shorten as desired. Muting is similarly refreshing, letting you quiet overly-prolific hashtags or people for as long as you need to - you can unmute everything with the touch of a button in the settings. One of the best aspects about Falcon Pro is that you can adjust the settings to manage battery life, such as only live updating when you’re on wi-fi, or when you have your charger plugged in. That’s a really nice touch, and Falcon Pro keeps your battery usage as low as any Twitter client I’ve seen. Twitter can be such a battery hog that it’s nice to see one app recognise the problem and handle it cleanly. If you can’t bear to spend $1.25, I recommend the free Falcon Widget, which lets you import your existing Twitter into a fullscreen, and gives you a few of the Falcon Pro goodies to boot. Very much recommended, for those with a single Twitter account.